We could write this off as coincidence if there weren’t dozens of other similar examples of the key feature of leading executives being strategic thinkers. Indra Nooyi of Pepsi, Dan Hesse of Sprint Nextel, Jeff Kindler of Pfizer and Alan Mullaly of Ford to name just a few more. 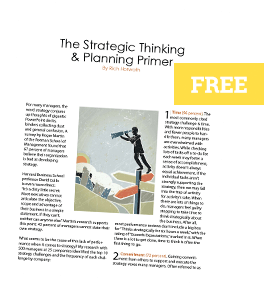 This supports three separate studies published by the American Management Association, Chief Executive Magazine and the Wall Street Journal showing that strategic thinking is now the #1 most valued skill in leaders today. Ironically, 50% of companies report that strategic thinking is the skill their senior leaders most need to improve. Guess those are the companies taking a beating in today’s economy.